Anyone who has been involved in mountain biking in California knows that April can be a busy time in the state. Someone from the California Trails and Greenways Foundation was really thinking when they planned the 2017 California Trails and Greenways Conference to be in Monterey just before the mecca known as the Sea Otter Classic. This annual conference provides two days of high-quality education and networking opportunities for urban, rural, and backcountry trail professionals. There are great opportunities here for participating in discussions with leaders in the field on the latest advances in trail design, maintenance, and construction as well as interpretation, volunteerism and management. SDMBA representatives have attended this conference for the past few years. This year, I attended the event with Kevin Loomis, SDMBA President, and Joshua Bonnici, one of our new board members. After we attended the conference on Wednesday and Thursday, we were going to be Sea Otter bound. Now I have attended Sea Otter many times over the years, but Kevin and Josh were going to be attending for the first time. I told them to be prepared to be amazed. But before the fun at Sea Otter could begin, we had planned not only on attending some of the public sessions at the conference but had also arranged to meet with other California International Mountain Bicycling Association (IMBA) Chapter leaders that were present, as well as with Laurel Harkness, IMBA California Regional Director, and other IMBA leadership including Executive Director, David Weins. SDMBA has been very transparent about current considerations regarding the ongoing chapter agreement with IMBA. These talks were very helpful for us to get our ideas and suggestions directly to IMBA leadership in face to face meetings. Discussions are ongoing to reach a mutually beneficial agreement and we will communicate these findings soon to our membership. The first day of the conference, I attended an all day field workshop led by Drew Perkins and Matt De Young of the Mountain Bikers of Santa Cruz. 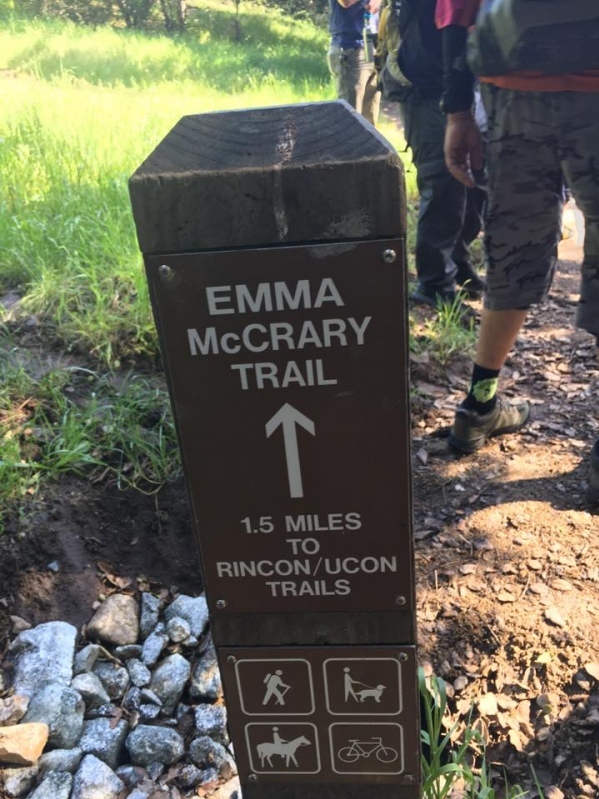 We did a complete walk through of the Emma McCrary Trail talking about each turn, each anchor point, each grade reversal, and why and how the trail came to be. We learned how this trail changed the character of the forest from a haven for drug dealers and other illegal activity to a prime recreational resource just adjacent to UC Santa Cruz. Surrounded by other mountain bike advocates and land managers from around the state offered the chance to not only learn from the story of this trail, but also to chat about common opportunities and issues that we deal with on a day to day basis. We compared notes on successes and challenges while we walked this amazing trail, all the time looking forward to the fact that our bikes had been shuttled up to the top of the trail so we could ride back down each smooth turn we had closely analyzed on the way up. Needless the say, the ride down was sweet. If you haven’t ridden some of the sweet work that the MBOSC have done, you owe it to yourself to make a visit there. We then took a quick ride on some Santa Cruz streets over to the Harvey West Pump Track. A small facility with a couple of jump lines and a maze of beautifully crafted and maintained bermed turns. Smiles were big on the 12 or so adults in the group who took to the track to try their skills. On Thursday of the conference, I attended a session about successful federal partnerships with Garrett Villanueva of the National Forest Service. Garrett outlined the National Forest Services initiatives and priorities in working with community and non-profit partners to get projects and trail work done within the forest. With Garrett’s help and the support of our local Cleveland National Forest staff in San Diego County, SDMBA is looking ahead to some real progress for trail development and maintenance. Solid discussions were had to have Garrett come to San Diego this fall to conduct a Trail Stewardship Workshop and other learning sessions for local land managers and other trail advocates. SDMBA is looking forward some amazing progress on projects in the Descanso and Palomar Districts including the Pamo Valley - Orosco Ridge Trail Concept Plan. I also attended sessions on grants and other funding opportunities as well as a presentation on the Teen Trail Corps Program with Austin McInerny (Executive Director, National Interscholastic Cycling Association), Steve Messer (President, CORBA) and Laurel Harkness (California Regional Director, IMBA). A personal goal of mine is to get more of our local high school racers out to trail work days so they can learn about advocacy and become lifelong stewards. I was encouraged at our recent advocacy meeting in Ramona on the Pamo Valley Project by all the student-athletes from Ramona High School who attended with their coaches and parents. On Friday morning the pilgrimage to Sea Otter began. 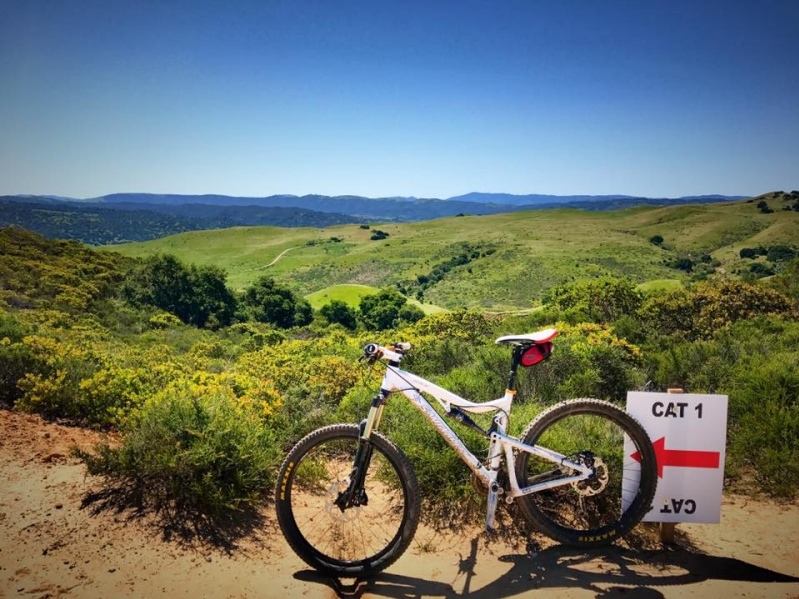 The anticipation of seeing old friends and riding narrow hero dirt singletrack through the rolling hills of Fort Ord started to build as we drove east from town toward Laguna Seca Raceway. We set up camp in the hills near the downhill start house which proved to be highly entertaining with impromptu jump shows which the campground hosts and security had trouble keeping up with. I spent all of Friday making the rounds visiting sponsors, like Jenson USA, Timber MTB Bells, Shimano, Bike Magazine, Zoic, TASCO and so many more. As usual lots of time chatting SDMBA happenings as well as looking at new products and amazing bikes of all descriptions. E-bikes again had a big presence which proved to be a hot topic of conversation at times fairly heated. On Saturday, we participated the Mountain Bike Grand Fondo, a 22 mile sampler of all that Ford Ord has to offer. Sweeping ridge line descents, swooping buttery singletrack framed by very lush poison oak and long (very long) ascents back to Laguna Seca. Lots of friends and happy chatter on the trails! We got back to the Expo area, watched the dual slalom finals as well as a little Cat 1/Pro Downhill practice. All in all a great Sea Otter, including the weather which can’t always be said. Best part was sharing the event with Kevin, Josh and some other friends who were first timers. They were overwhelmed and smiling the entire time! A very successful trip --perfect combination of some meaningful work around best practices of trails professionals as well as networking with industry connections at Sea Otter.